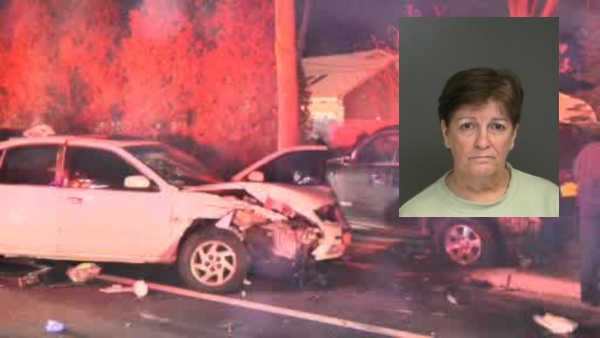 MEDFORD, Long Island (WABC) -- Police on Long Island have arrested a woman who they said left the scene of a car crash that killed one person and injured three. Kathy Horan, 61, of Medford, was arrested and charged with leaving the scene of an incident without reporting involving a fatality and leaving the scene involving serious physical injury. According to the Suffolk County Police Department, Horan was traveling east on Granny Road in Medford around 8:20 p.m. Friday when her 2014 Hyundai Santa Fe struck another car. Peter Quoma, 28, of Selden, had gotten out of his 1997 Nissan Maxima after hitting a parked vehicle when he was hit by Horan, police said. He was taken to Brookhaven Memorial hospital in East Patchogue where he was pronounced dead. His two passengers, a man and a woman, who remained in the vehicle, were taken to Stony Brook University Hospital and treated for minor injuries. The woman, 58, of Lake Grove, who had been standing by her parked vehicle, was taken to Brookhaven where she is being treated for serious injuries.